For as long as I can remember, I've been visiting Patchouli's on 30A. Loved their original spot in Seaside... and like their store in Rosemary Beach even more. They have a slew of fantastic products from top cosmetic, candle and skincare lines, but what I can't get enough of is their custom scent bar. Yes, you can create your own lotion, perfume...or my favorite....body oil. 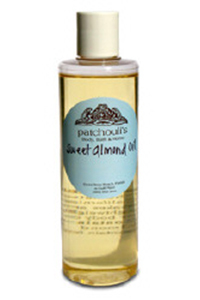 My top choice is always their Sweet Almond Oil ($20). It is the most incredible blend; choose a scent that speaks to you. They are fantastic at mixing it up. I almost always go back to the one I fell in love with, aptly named 'the beach'. It's a blend that reminds me of dunes, sand and great times. I purchase 3-4 bottles each visit. For when I cannot get to this beach-lovers haven, I create my own concoction at home. It will never master the same scent as their beach version, but it works for me. I use their bottles to mix in, and to display in my shower to make it feel like I'm indulging a bit. Mix together and keep in your shower. Put on before you dry off for silky smooth skin. Also play with the essential oils and fragrances to come up with something you love. There is an incredible selection at Whole Foods Body, so you can change it up to suit your taste. If you love fig, basil or anything else, chances are there is an essential oil on the shelf. Cost per bottle... about $4, which makes it even sweeter! I'm headed to 30A in less than 12 hours and will definitely pick up the latest concoctions from Patchouli's, but would love to hear about your favorite products.. and where you get them? Please do share it all on the Southern Sophisticate? I am glad to see you love oils. I use young living essential oils and I truly say they do magical things to your body! I use lemon, spruce, lavender, and many more blends ...I also add them into the water to drink...They have interesting names of blends from Joy to Surrender, Passion, JOY and Abundance. Great oils..